The Creek Indians are more properly called the Muscogee, alternatively spelled Mvskoke. Creek oral tradition, recorded in the eighteenth century, told a legend of migration of one group of ancestral Creeks who established a colony at the Ocmulgee site near present Macon, Georgia. From that colony grew the pivotal towns of Cusseta and Coweta, in the period of A.D. 900–1000. The historic Creek Confederacy eventually was widespread and influential. Early-twentieth-century scientists speculated that Mississippian migrants had left their homeland in the central Mississippi Valley and journeyed onto the Macon Plateau, settling at Ocmulgee before beginning their regional expansion. Archaeologists corroborated that Ocmulgee Mounds was one of the ancestral Creek residences. Subsequent archaeological investigations indicated that Creek Indians derived from prehistoric southern Appalachian Woodland cultures such as the Western Lamar in the region of present Georgia and Alabama. While there were local variations, all were believed to share what is termed Mississippian culture. They resided in fortified towns that had flat-topped pyramidal temple mounds surrounding a central plaza. The Mississippian culture declined after A.D. 1400, and the sites then became single-mound ceremonial centers among separate towns that were either related or allied. Perhaps half of them used the Mvskoke language, which was spoken along the Coosa and Tallapoosa watercourses, but those who lived along the Chattahoochee River perhaps spoke Hitchiti and Euchee. Although the people spoke different languages, they shared basic traits and beliefs with other Southeastern Indians. The arrival of Europeans accelerated cultural decline and had a devastating demographic impact upon the natives. Coosa had been an influential paramount chiefdom prior to the Hernando de Soto expedition's visit in the 1540s but rapidly declined in the aftermath. The diseases introduced by those Spaniards devastated the Creek towns, and the survivors coalesced as populations shifted. Refugees from Coosa along the Coosawattee River at the headwaters of the Coosa River in northwestern Georgia moved downstream to Alabama. There they merged with other town survivors such as Abika. 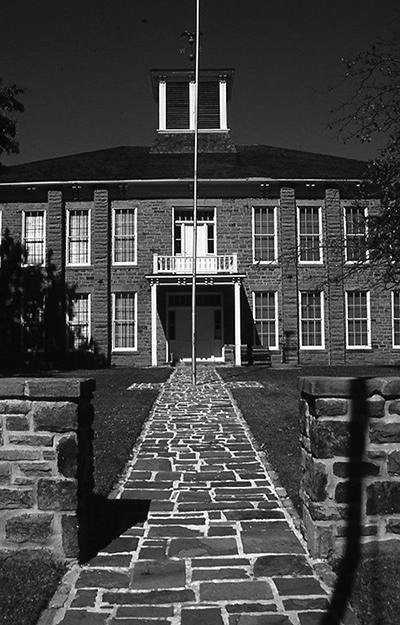 The towns of Abika, Coosa, Coweta, and Tuckabatchee are considered the four "mother" towns of the Creek Confederacy and are featured in oral migration stories. Each Creek town had a ceremonial center like the former Mississippian plaza. At one edge was a rotunda or council house in which elders transacted town business. Nearby were a chunkey yard and a ball-play ground. Maternal clans determined membership in the society, but members also held loyalty to a town beyond the clan, unlike many other Indian tribes. The confederacy's towns were divided into red/war and white/peace groups. With the assistance of advisors, a meko ruled each town. Creek clans and towns met once every year. During the early eighteenth century the Creek population of more than twenty thousand occupied at least fifty towns. Population shifts, amalgamation of town survivors, pressure from slave traders, and changes in trade practices all combined to accelerate a long-term trend toward merging groups aimed at stability. This led to the formation of what Europeans termed the Creek Confederacy, especially under Alexander McGillivray in the late eighteenth century. British traders labeled the Indians along the Ochese Creek by that geographic name, and eventually it was simplified to "Creeks." The Indian slave trade, which transformed the interior of the Southeast to 1717, was replaced by the deerskin trade through the first half of the eighteenth century. Trade helped transform Indian society. After the pivotal Yamasee War (1715–16) ended, the influence of the Creek Confederacy peaked while the Upper Creek division of the Creek Nation coalesced. The emerging division of the confederacy led Upper Creeks to reside along the Tallapoosa River in northwestern Georgia. Lower Creeks lived along the Chattahoochee River and its tributaries in southeastern Alabama. Rival European desires, combined with shrewd native diplomatic and survival skills, made the Creek predominant in the region. They maintained a delicate balance of French, Spanish, and British colonial interests until the British emerged in 1763 as the sole European power. The American influence succeeded the British after 1783. McGillivray's death in 1793 left Creek interests under the guidance of U.S. Indian Agent Benjamin Hawkins in that decade. He implemented an assimilation policy that emphasized missions, education, and individualized farming. His policy made inroads among Lower Creek towns. Eventually, the changes that became visible, such as ownership of slaves, Anglo clothing and lifestyle, and restructured government, lent the assumption and label "civilized" to the tribe. The "Red Stick War" of 1812–14 climaxed in what is known as the Battle of Horseshoe Bend, among the Upper Creeks. A punitive land cession resulted. The treaty led to increased Anglo settler pressure and to the growing prominence of William McIntosh of the Lower Creeks. The latter removed west of the Mississippi River in the 1820s. Thereafter, Opothleyahola's leadership of the Upper Creeks increased. The majority of the Creeks, along with their slaves, were removed over their Trail of Tears to a new Indian Territory, now Oklahoma, through the late 1830s. Lower Creeks settled in the Three Forks area of the Arkansas River in Indian Territory, and the Upper Creeks lived along the North Fork, Deep Fork, and Canadian river valleys in their new homeland. They still showed the ancient divisions of their old confederacy. The disparate groups, numbering perhaps only thirteen thousand by then, agreed in 1840 to a new national government, located at both Upper and Lower Creek sites of Council Hill, in present Tulsa. A new golden age of independent development ensued but was short lived. The Civil War destroyed much that had been built up in the Creek Nation, but another new national government, modeled on a bicameral legislative system similar to that of the United States, emerged after 1866. It was located at the newly selected national capital in Okmulgee. The nation formulated a new constitution the following year. A period of rebuilding began again while the tribe was left to its own influences, and the Creek Nation prospered. Schools, churches, and public houses were built as the tribe reestablished itself as a working government. At Okmulgee a national capitol building was constructed in 1867, and it was enlarged in 1878. Now a National Historic Landmark, the Creek National Capitol (the present Creek Council House Museum) is listed in the National Register of Historic Places (NR 66000632). The rebuilding of the tribe continued. Its florescence was marred by changes on the United States level that were all too familiar—land envy. Beginning in the 1880s an outburst of violence from a bloody political turmoil of resistance greeted the renewal of allotment and assimilation policies that climaxed with Oklahoma statehood in 1907. The Creeks lost more than two million acres of allotted domain. Through the late nineteenth and early twentieth centuries mainstream pressures gradually transformed many of the forty-seven tribal towns from ceremonial grounds into rural agricultural communities. Each of these centered on the Baptist Indian church, among Upper Creeks, or the Methodist Indian church, among descendants of Lower Creeks. The Oklahoma Indian Welfare Act (1936) helped establish the former Creek tribal towns of Kialegee, Thlopthlocco, and Alabama-Quassarte as sovereign nations. Beginning in 1970 the federal government permitted the Creek Nation to elect its own principal chief. The Harjo v. Kleppe (1976) case marked the end of federal paternalism and the start of a new era for a revitalized Indian nation. The elected government supports three branches of tribal governmental and ongoing economic development. There are presently more than fifty-eight thousand tribe members, based on a descendancy roll stemming from the Dawes allotment rolls. Some tribal citizens are spread throughout the eleven Oklahoma counties that formed the historic Creek Nation boundaries as well as throughout the world. A mix of gaming, farming, and other business income has been combined with federal expenditures to support a wide range of Creek Nation programs and services. These have included tribal government offices, a national council, a tribal court system, a police force, business enterprises, health care, housing, education, and expenditures on infrastructure within the boundaries of the historic Creek Nation. A new constitution in 1975 replaced the 1867 document. A series of federal court decisions through the 1980s helped bolster Creek Nation sovereignty. Creek claimants that are scattered across the Southeast have sought federal recognition. The Poarch Band of Eastern Creeks in southern Alabama gained recognition in 1984. More than two thousand of them reside near Atmore, a town in the ancient Creek homeland. Still other Creeks are spread throughout the nation in an urban diaspora, with Creek families seeking employment in Dallas, Los Angeles, Phoenix, and other cities. There are also descendants among most ethnic groups in the United States, including blacks, who are called freedmen, although the latter have no tribal rights. Despite tragedies and drastic changes over the years, the Muscogee survived. Through a series of rebuilding stages, the culture, the language, the hymns, the medicine songs, and the traditions were still enjoyed into the early twenty-first century. The people have continued to celebrate their cultural heritage. They still danced around the sacred fire and sang sacred songs to their Creator, and they still offered hymns to their Savior. They have continued to transact tribal business in the Mvskoke language. New stories of contemporary life have joined ancient oral literature to chronicle cultural activities, including the high jinks of the trickster Rabbit, the traditional culture hero. As in those stories, the Mvskoke people have learned lessons of perseverance and overcoming adversity, which is the hallmark of the Este Mvskokvlke (Creek people) of the old Southeast. Michael D. Green, The Creeks (New York: Chelsea House, 1990). Douglas A. Hurt, "'The Indian Home is Undone;: Anglo Intrusion, Colonization, and the Creek Nation, 1867–1907," The Chronicles of Oklahoma 83 (Summer 2005). John R. Swanton, Early History of the Creek Indians and Their Neighbors (1922; reprint, Gainesville: University Press of Florida, 1998). Theodore Isham and Blue Clark, "Creek (Mvskoke)," The Encyclopedia of Oklahoma History and Culture, https://www.okhistory.org/publications/enc/entry.php?entry=CR006.